Break the binge eating cycle with recovery-oriented, CBT and mindfulness strategies. A healthy relationship with food also includes how we think and feel about ourselves. 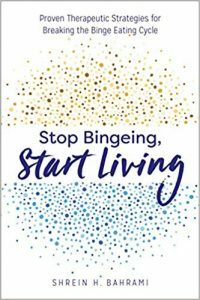 Healing both mind and body, Stop Bingeing, Start Living arms you with proven therapeutic and wellness strategies to free yourself from self-judgement and finally put an end to binge eating. Through intuitive and mindful eating activities, these strategies show you how to listen to your body to change your relationship with food. Combined with highly effective CBT exercises, you’ll learn how to rewire your brain to overcome urges and strengthen your mind-body-soul connection. An introduction that helps you better understand your relationship to food, complete with the latest research and reflective exercises. A holistic plan that uses CBT, ACT, and mindfulness therapies to help you eat mindfully and intuitively. A recovery toolbox that includes actionable strategies and exercises such as self-assessments, reflective prompts, and goal setting exercises to guide you through your journey. Imagine a new vision for your life wherein you can live without the constant focus on weight and food. To turn that vision into a reality, Stop Bingeing, Start Living equips you with actionable strategies to start managing emotions and stop binge eating. Purchase the book now via the link below and you will receive a signed copy and personalize note from Shrein.